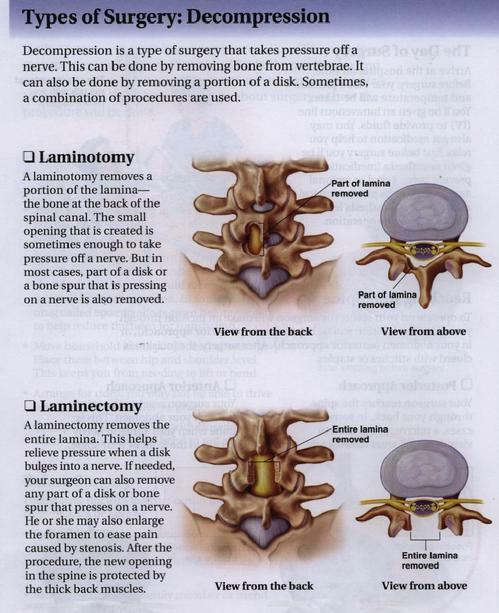 Laminectomies & Laminotomies are surgical procedures for the treatment of herniated discs, spondylosis, synovial cysts, & spinal stenosis. This procedure is done to decompress the nerve by shaving off part of the disc, cyst, or spur that is putting pressure on it. Hospital stay is at least 24 hours, a rehab program is started 3 weeks after surgery & patients usually return to pre-surgery status after about 8 weeks.